MEF's Vision is to 'Be the best service provider in the region', as measured by Customer Satisfaction; Quality of Service; Financial Profitability, Growth and high standards of Health and Safety. Middle East Ship Stores was established as a sole establishment offering shipping supply services at UAE ports. Working relationship with Fuji Trading Company Ltd. Japan begins. Middle East Ship Stores is the first marine supplier in Dubai to acquire ISO 9001 Certification for Quality Management System. Official joint venture with Fuji Trading Co., Ltd. Japan. 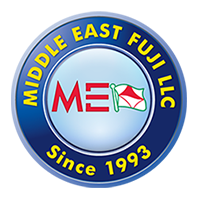 The company name changed to Middle East Fuji LLC. Middle East Fuji Khimji Co. LLC is established in Muscat, Oman. Began catering and facility management operations for Djibouti Anti-Piracy Enforcement (DAPE) Camp of Japanese Maritime Self Defense Navy Force. Middle East Fuji LLC bought and acquired full ownership of the land from Dubai Government for its head office and new warehouse.